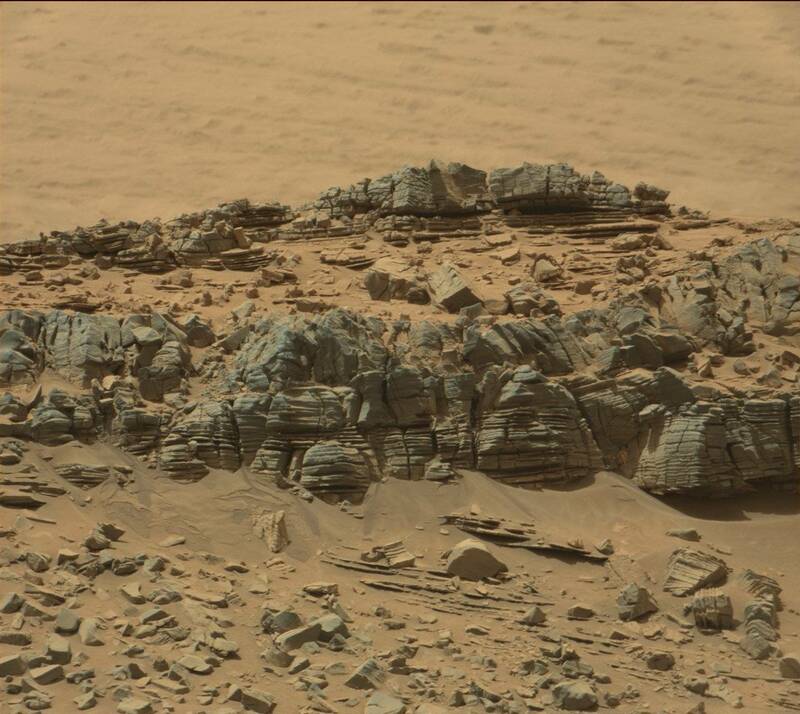 Does This NASA Photo Reveal A Crab-Like Alien On Mars? Is there life on Mars? Maybe. Or maybe there was. And maybe it was giant crab creatures that crawled over the red planet's surface and have since disappeared. Only to reappear in fossilised form in a NASA photo released recently that had social media throwing all kinds of crazy ideas around about what is and what it all means. Mars is used to this kind of thing though. From the Face on Mars (which is actually a mesa) to claims of a pyramid built by ancient extraterrestrial civilisations (which is actually just a rock), the red planet has long captured our imaginations and given fuel for conspiracy theories. The latest is one surrounding a photo taken by the Curiosity Rover which was picked up by Facebook group Journey to the Surface of the MARS. Is it a crab, is it a rock formation, is it a facehugger from the Alien films, if so, where's Ripley? Now, if you look on the right hand side there's something in the rock formations. Something...crab-like. 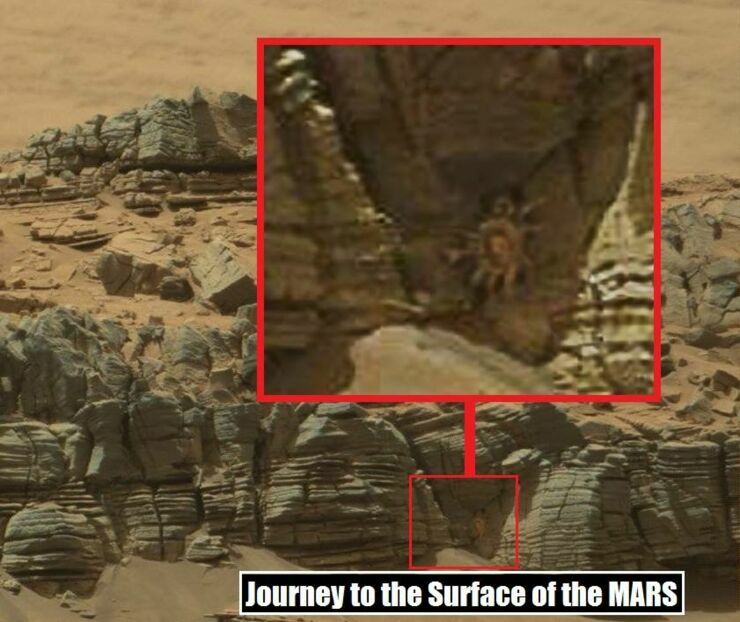 Journey to the Surface of the MARS, whose slogan is "They will not tell the truth about MARS", zoomed in on the image so users could get a closer look saying "Now this one is AWESOME !!!.. . . . ..'CAVE GUARD'"
And users started to weigh in with what they thought this mysterious form might be. "Spider”, “Alien”, “John carter”, "Crab People from Mars!! ", “Awesome Martian space crab! ", "Purple People eater", "It's a door", "Can we rule 34 this thing already?" 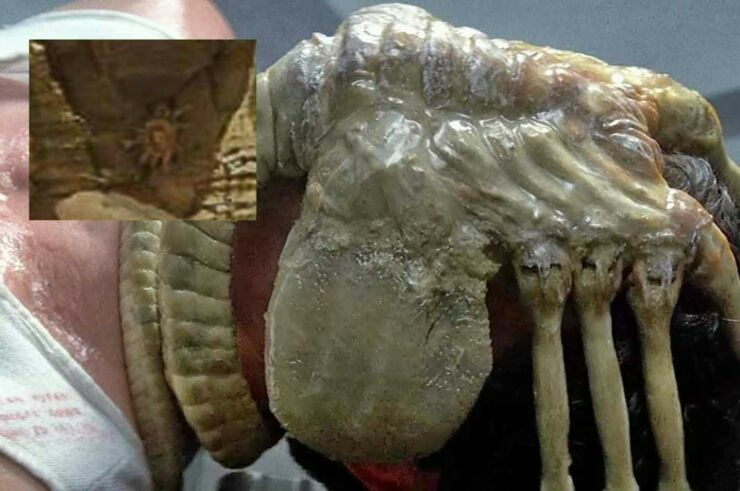 and "Hopefully, It's the face sucker from Alien. And someone will want to marry it." were some of the insights. But, sadly, it probably isn't an alien creature with tentacles, or a plant, or any living form. It's probably just a rock and we're projecting what we want to see on to it. Director of the Centre for SETI Research Seth Shostak has said it's a classic case of pareidolia, which is when we think we see something on an object or surface, when actually it's all in our mind. Like seeing images in the clouds or, say, seeing the Face on Mars. And Shostak should know, he gets lots of images sent to him with claims like this all the time. "Those that send them to me are generally quite excited, as they claim that these frequently resemble something you wouldn't expect to find on the rusty, dusty surface of the Red Planet." he notes. "It's usually some sort of animal, but occasionally even weirder objects such as automobile parts. Maybe they think there are cars on Mars. Recognizing a crab in a landscape filled with wind-weathered rocks is no more surprising‚ nor more significant than seeing a winking face in a semi-colon followed by a parenthesis. ;)"
So there you have it. 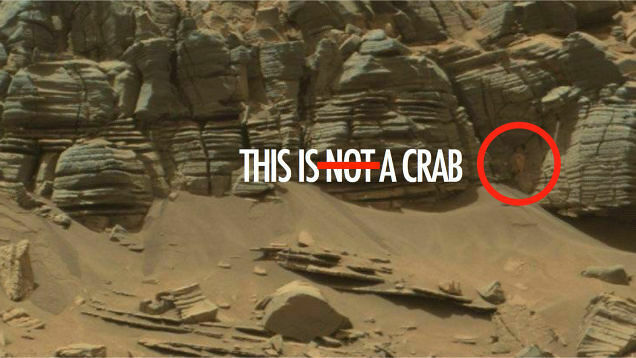 No crabs on Mars, just crabs in your mind.